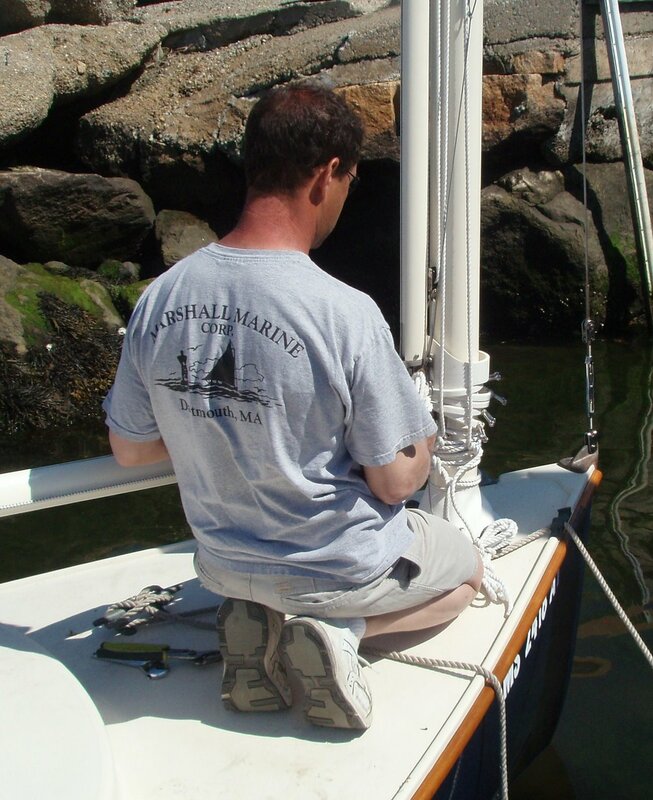 In order to maintain your catboat in top shape we offer the following basic tips. All boats can be fun to work on and we certainly encourage the do-it yourselfers to tackle many of these projects. We are always available for advice or parts and if you want us to take care of these jobs for you we offer storage and a full range of services at Marshall Marine. 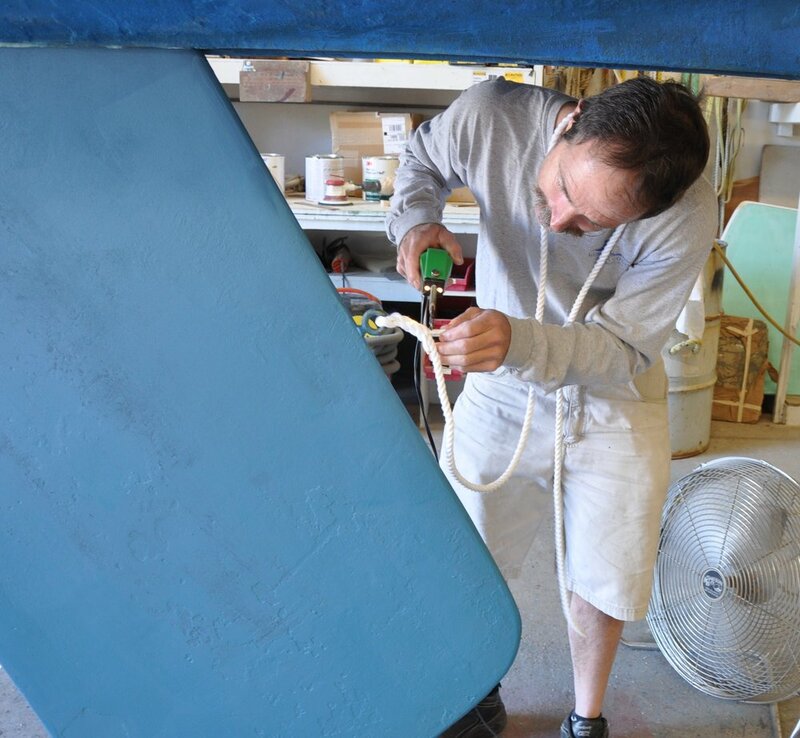 We always recommend cleaning and waxing the hull every spring to keep the gel-coat from oxidizing and fading. This is especially important with dark hulled boats as the fading becomes much more noticeable over time. If the hull has faded and you are trying to restore the color, try some fine compound. For badly oxidized hulls you may need to use a more aggressive coarse compound before the fine compound and wax. This can be a fair amount of work with mixed results, so painting the hull with Awlgrip is another option. 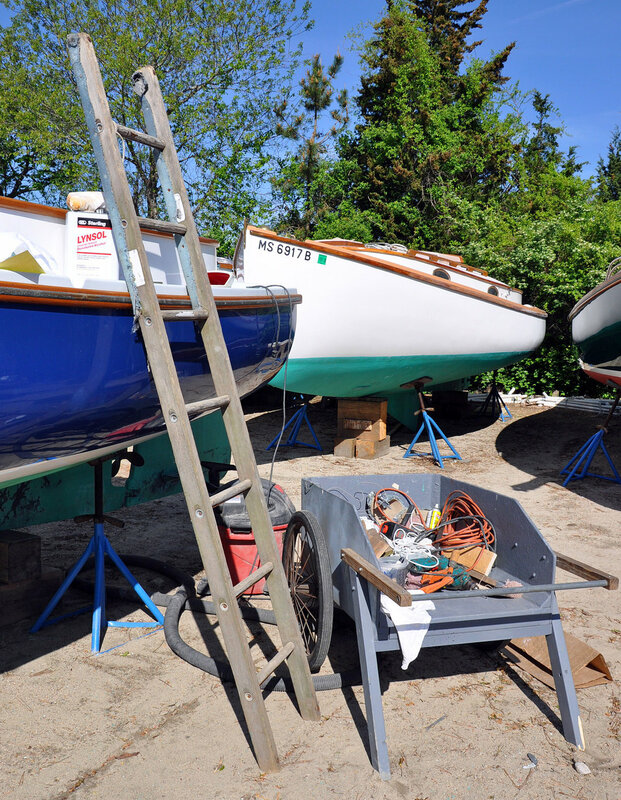 In most instances where your boat will be kept in the water during the sailing season we recommend applying a fresh coat of bottom paint to prevent growth. There are many different types of bottom paint which can be used for various types of uses of the boat. In general we recommend using an ablative paint to avoid heavy build up of bottom paint over the years. In the spring we recommend applying a fresh coat of finish to all of the teak trim, whether you are using oil, Cetol or varnish. This helps protect the finish from the sun’s harmful UV rays which can wear out the coatings. If there are bare spots from the previous season it is a good idea to sand and spot coat these prior to a full coat in order to get some built up layers. On the other hand, teak is impervious to rot, so if you like the appearance of naturally grayed teak, leaving it bare of all finish is acceptable and requires very little maintenance; just a little cleaning once in a while. Prior to stepping the mast each spring we recommend waxing the mast and the inside of the gaff saddle. This allows for the saddle and mast hoops to slide freely up and down which makes raising and lowering the sail much easier. It is always a good idea to make sure your halyard and mainsheet blocks are in good working order and your running rigging is in good shape with no worn spots or frayed ends. Stiff blocks can cause difficulty in raising and lowering the sail, and as halyards and the main sheet get older they can get stiff which will hinder their ability to easily run through the blocks. Inspect both the gaff and boom gooseneck fitting every spring as well as the gaff saddle to make sure they are in solid shape. These pieces of hardware can be under a great deal of stress at times and they can get bent or broken. Mast wedges play a very important part in the catboat rigging. This includes wedges in the step as well as the mast partners. On the Marshall 22 there are 14 wedges for the partners which are all the same shape and two or three heel wedges. For the Sanderling there are 7 forward wedges (longer with a narrower taper) and 6 aft wedges (shorter with a wider taper) and two or three heel wedges. The Sandpiper has 6 forward wedges and 4 aft wedges and no heel wedges. When the mast is first stepped you will want to set the heel wedges first. In the case of the Sanderling and the Marshall 22 you will set one wedge forward of the mast and another aft of the mast in the step. If the wedges are hitting the hull and are still loose, you can add another wedge on the forward side to secure the heel. After the heel wedges are set you can install the wedges in the mast partners. Start by setting two forward and two aft ones in and press them in place until they hold the mast. Next set the rest of the wedges in place and push them down by hand as far as you can. Now you can start to hammer them down. I recommend a plastic tapping mallet for this as it provides a good wallop but won’t scratch the mast when a wedge is missed. Work your way around the mast evenly and try to drive them all down the same distance. Don’t be afraid to split one. It’s better to have a split wedge with a snug fit than a loose one that can work its way out as the rig moves. You shouldn’t be able to move any of them with your fingers when they’re in tight and the mast boot should fit over them easily. In all cases, whether your engine is an inboard or and outboard, the maintenance procedure specified by the engine manufacturer should be followed. As a routine maintenance program for inboard diesels we recommend changing the oil and filters in the fall prior to winterization. During this procedure you should give the engine a thorough inspection for any signs of fluid leaks, worn belts, or any other sign that something may require attention. It is always more efficient to address the issue at this time than when you are possibly rushing to get the boat launched the next season. In the spring the zincs and impeller should be replaced as well as the fuel filters. Once the boat is launched, run the engine for at least and hour while monitoring it to make sure it is running smoothly, charging properly and not overheating. The tiller steering on the Sanderling and Sandpiper is as simple as can be although keep an eye on the pintles and gudgeons which can show signs of wear. This is usually caused from excess motion of the rudder swinging back and forth as the boat rides on a mooring in a rough anchorage. Try to secure the rudder either with tiller tie off lines or a rudder lock. On the Marshall 22 steering system, lubricate the rack gear and pinion gear every spring with good marine grease. The pinion gear is accessed by removing the top of the steering box and the rack gear can be reached from the port cockpit locker in the boats built after 1983, or under the seat in the boats built before 1983. The centerboard pennant should be checked for wear every spring and as a matter of course, replaced every five years or as required. It is a relatively easy replacement, but can lead to bigger problems if it breaks mid season. During the season the sail should always be covered by the sail cover when not in use to protect it from the suns UV rays which can shorten the life span of any sail. In the winter the sail and canvas should be removed from the boat, washed, dried and stored in a dry location.